If you're searching for something nostalgic for your Halloween costume this year, consider dressing like one of the Smurfs. These lovable and iconic blue characters are instantly recognizable, full of charm and personality. Smurf costumes are available in a wide range, from infant through adults. The men's Smurf costume is simple and comfortable. It includes a blue shirt, white pants with blue tail and a white hat. The patriarch of the Smurfs has his own costume for men. It includes a blue shirt, red pants with blue tail, red hat and a white beard. Hefty Smurf has his own costume with this plus sized men's version. It includes a blue shirt, white pants with blue tail, white shoe covers, blue four-fingered hands and a white hat. Smurfette, the lone female Smurf has her own costume as well. It includes a blue shirt that has a white dress attached to it, blue pants and a white hat. 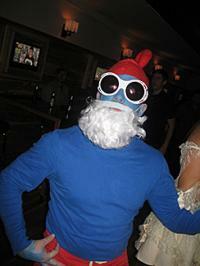 Boys can dress up in groups in this Smurf costume to create a crowd of Smurfs. The costume includes a blue shirt, white pants with blue tail, blue four-fingered hands, white shoe covers and a white hat. Girls can join the fun as Smurfette as well. The costume includes a blue shirt with white dress attached, blue pants and a white hat. Available in sizes up to two years, the infant and toddler Smurf costume is as simple as it is adorable. It consists of a one-piece romper that includes shoe covers and a white hat. 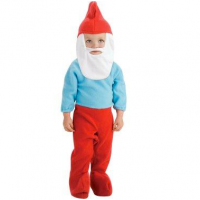 Dress your baby or toddler up as a miniature Papa Smurf. Available in sizes up to two years, the costume is a one-piece romper of blue and red that includes shoe covers. A red hat and white beard complete the costume. 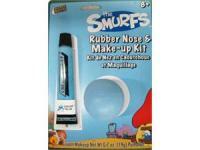 Baby and toddler girls can join the fun as Smurfette. The one-piece romper has an attached dress, as well as shoe covers. A white hat completes the costume. In addition to the available costumes, there are also masks for limited characters. 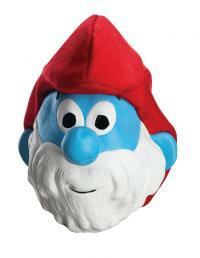 Adult Papa Smurf: The mask fits three-fourths of the head and includes the red hat. Adult Brainy Smurf: The mask covers three-fourths of the head and includes a hat and glasses. 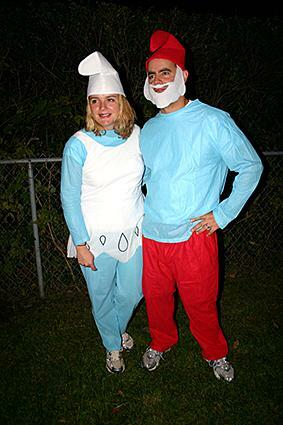 If you're interested in making your own costume, you shouldn't have much trouble coming up with a Smurf Design. The men's costume is simple and can be made with just four pieces. Fold a small piece of blue fabric into a roll about 2-inches long and sew it onto the back of the pants. Put on the pants, shirt and stocking cap and accessorize to create the Smurf character you like best. Dressing as Smurfette is simple and requires only a few more things than the men's costume to complete. Layer the white dress over the blue shirt and tights. Add white heels, a white stocking hat and a blond wig to complete the look. The Smurfs are recognized easily by many people. Dress up as one of these iconic characters to bring some nostalgia and an easy opener to any party.